NAUGATUCK — The Board of Mayor and Burgesses last week approved a pension of $2,532 per month for former Police Chief Christopher Edson. 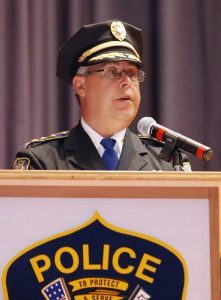 Edson, who was hired as chief in 2007, retired from the department. His last day was March 2. Edson’s pension was calculated based on the average of his gross pay for the three calendar years he grossed the most and time served at the department. The board approved the pension, 7-2, with burgesses Robert Neth and Carl Herb voting against the pension. Neth said he voted against it because he didn’t vote in favor of extending Edson’s contract in 2016. Wow, 2 pensions. One from Milford another from Naug.